From walking to food tours to photography tours, there are so many different tours that you can do in Lisbon. Each tour offers a different perspective on the city, and they are a fantastic way to learn about the city’s culture, food, architecture, and history from people that are truly passionate about Lisbon. The following are just a few of the different types of tours available. Walking tours are one of the best ways to get a feel for a new city like Lisbon, which most people don’t know a lot about. In just a couple of hours, you can brush up on Portuguese history and culture while also getting shown the main attractions around town. Doing the tour early on in your trip will give you an idea of what all the main attractions are, and which ones you want to come back to spend more time at. A cuisine can tell you so much about a country and, aside from the pastel de nata, Portuguese cuisine isn’t really that well known outside of Portugal. A food tour of Lisbon is the perfect way to get to grips with Portuguese food, and to sample a lot of different Portuguese dishes in one go. Lisbon isn’t traditionally a bike-friendly city, but that’s all starting to change. Drivers are becoming more accommodating, although having a tour guide to help you will definitely make things easier. There are now several companies that offer cycling tours of Lisbon. Some of the company also offer e-bikes, which make it a lot easier to get up Lisbon’s 7 hills. Hop on, hop off bus tours are the traditional way to see a city, and there are several bus tour companies that operate in Lisbon. These tours take you around all of the key attractions, including those that are a little further outside of the city centre like Belém and Parque das Nações. If you’re short on time, for example if you’re visiting Lisbon on a cruise or a stopover, they’re perfect for seeing the city in a short amount of time. Segways have become extremely popular in recent years, and you’ll find segway tours that take you throughout Lisbon – particularly in Alfama and through parts of Belém. Although there is a tour aspect to them, for most people it’s really just a chance to play on a segway more than anything else. That’s fine, of course, but, if you want to learn about Lisbon’s history and culture, you may want to take another tour. You might think from all the tuk-tuks around Lisbon that they’re a part of Portuguese culture like they are in Asia but that’s definitely not the case. Not even the ones that have been designed to look like trams. A few years ago, tuk-tuks didn’t exist in Portugal. Somebody obviously saw them in Asia, and thought that they would work well in Portugal. They’re now everywhere in Lisbon and Porto, and they’re popping up in other parts of the country as well. And, they do work quite well. They’re much smaller than cars so they can get around Lisbon’s narrow streets a lot easier, and some tuk-tuks are electric which means they’re much better for the environment. They may look a bit ridiculous, but it’s hard to be annoyed if they’re reducing pollution in Lisbon. Lisbon has a great street art scene and, if you’re into cool graffiti, there are some really interesting examples dotted around the city. Lisbon is quite a unique place for street art because it’s actively encouraged, and that means the quality is very high. Street art tours are great because they bring you around Lisbon and show you all of the best examples. Just as importantly, they also tell you about the artist behind the work and a little bit of the piece’s history. Photography and travel go hand-in-hand. Some people take photography seriously, and it’s their reason for travel, while others just want some great snaps for their Instagram. It doesn’t matter which category you fall into, a photography tour is a great way to explore Lisbon. Your guide will take you to some of the most photogenic spots around the city, and show you how to take some really great photos. A lot of people like to explore Lisbon by tram, but most people take Tram 28. Unfortunately, this tram has become incredibly popular with tourists and there are now often lengthy queues to get on. And, once you do, you’re often packed shoulder-to-shoulder like fish in a sardine tin. 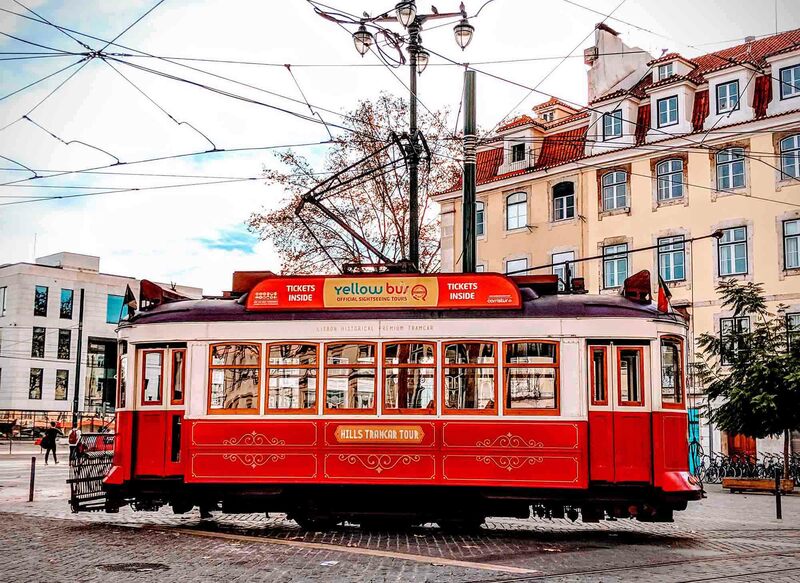 As an alternative, you could take a tram tour of Lisbon. Although more expensive than taking public transport, it’ll be much more comfortable and you’ll get the benefit of things like an audio guide as well as the ability to hop on and hop off. Another way to experience Lisbon is from the water, and there are several companies that offer boat tours of Lisbon. These range from family-friendly tour buses that go into the water to river cruises and boat tours that take you around all of the main waterfront attractions. Most tours focus on showing you the best attractions in a city or on telling you about a place’s history and culture. Pub crawl tours, on the other hand, focus on showing you a good time. There are several pub crawls in Lisbon that take you around the best bars and clubs in Lisbon, particularly in the Bairro Alto but also in neighbourhoods like Cais do Sodré as well. These can be a great way to meet people, and a good way to explore Lisbon’s nightlife as well. How much is the hop-on and hop-off tour in feb.